Do you have a special someone whose photograph you want to display with love? Would you like to give a special someone an extra-special gift that lets them know how treasured they are by you? 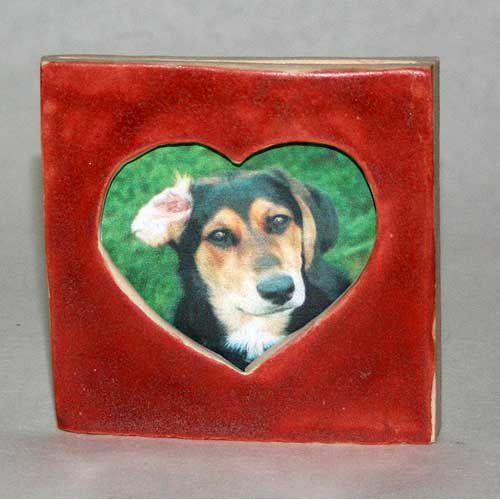 Then this heart picture frame is the pottery project for you. Clay (approximately 1/2 to 1 pound) -- I used a peachy-tan mid-range stoneware clay body for my heart picture frame because I like the warmth of the color. However, you may want to use a white clay body. I would suggest avoiding speckled or dark clay bodies for this project. Temperature range is your choice, although you are likely to have less difficulty with warping if the picture frame is fired in the low-fire range. Glaze(s) -- I used Amaco's Chun Plum, from their cone 5-6 Potter's Choice series of glazes. You may also choose to go with a single glaze, overlap glazes to create designs, or you may want to paint designs with underglazes, then cover with a clear glaze. Working Surface -- a piece of heavy canvas will make a good work surface for this project. If you think the picture frame will have to dry flat on its back, you will also want a wire rack, like a rack used to cool cookies, so that air can circulate all the way around the piece. Tools -- You can use minimal tools for this project: a rolling pin, two 2-foot lengths of firing strip, a potter's needle, scissors or utility knife, a plastic drinking straw, and a brush for slipping and glazing. I also used a hard fettling knife, a very sharp cut-out tool, a SurForm blade, and fine-grit sandpaper. Begin by wedging your clay so that it is a smooth, even consistency without any air bubbles or pockets. Determine how large you want your final piece to be and make a paper template for your desired size and shape. I used a square template that was three and a half inches by three and a half inches. Tip: Remember that the clay will shrink. My frame, once glazed and fired, shrunk to just over three and an eighth inches in both directions. Adjust the beginning size for your clay body's shrinkage as needed. Roll out your slabs on the canvas to the desired size and thickness, being sure to roll in all directions. Use the template you already made, being sure to place the template in an interior area so that the cut slab will be completely even in depth. You can do this with your potter's needle, although I used a fettling knife instead. The longer blade can be used as its own straight-edge, cutting down from the tip in a paper cutter-like motion or the motion used to chop vegetables with a chef's knife (but cut downward only once). Tip: Keep the needle shaft or knife blade perpendicular to the work surface. Otherwise, you'll get a beveled cut that may cause problems later. Tip: Do not drag the needle or knife tip through the slab, as that will distort the shape you are cutting out. After cutting the panel out (or both panels if they will fit), remove the excess clay from around the shapes, lifting them carefully and saving at least some of the scrapes for the frame's sides. Do not lift or move the panels, since this will distort them. Tip: If you want to make certain that your frame will not collapse into the area where the photograph will be, you can cut out a third panel using your template. Trim that third panel down by one eighth to one-quarter of an inch on all sides other than the one which will be open to slid photos in and out. This panel will become a filler, which I'll tell you how to use as we continue. Make a template for your heart-shaped opening, where your photograph will be seen when the frame is complete. Using either your first-panel template or one made from it, fold it in half. Draw half a heart, so that the heart's upper dimple and pointy tail are both flush against the fold. Cut out the template opening using scissors or a utility blade (making certain you are cutting on a protected surface). After the cut has been made all the way around, poke your needle or knife tip into the center of the heart and lift the excess clay away. Allow your panels to stiffen to medium leather-hard. While they are drying, make the frame's sides. Use the scraps from when you cut out the panels. Cut three thin strips of approximately an eighth to a quarter of an inch from side to side for a square or rectangular frame. If you are making a different shape, cut out the sides you need, remembering that you will need to leave an opening at the top of your picture frame for the photograph to slide into place. Use your needle tool and score the front and back panels and side strips. The scoring should be on the interior flat side of both the front and back panels, not on the thin outside edge. (Note the placement of the side strips in the photograph. They are placed on top of the scored surface of the back panel.) Only score three sides, leaving the top of the frame open. Use your brush to apply slip to the scored areas of the back panel. Place the side strips on the back panel and press down evenly. Slip the scored top area of the side strips. Before you put the front panel in place, clean up any excess slip. Fill the space with something that will allow the clay to shrink, such as newspaper, paper towels, or a filler panel of clay. If you cut out a filler panel in Step Three, wrap it in a newspaper or a double layer of paper towels. You want the wrapping to be smooth; it is there to keep the filler panel from inadvertently adhering to the frame as it dries. Place the covered filler panel onto the back panel, in the area between the side strips. If need be, remove the wrapping and trim the filler panel to fit without being against the side strips. Place the front panel down on the side strips so that the scoring is against each other. Press down evenly and firmly. Tip: A piece of heavy cardboard or fiberboard can be used to apply even pressure when attaching the frame's parts together. Once the slip has stiffened, carefully turn the assembled frame over so the back is facing upward. You will use a plastic drinking straw to punch a hole through the back panel, so your frame can be hung from the wall. First, measure the panel at the top, where the opening is, from side to side. Lightly mark the center, about a half inch to an inch below the opening. Slide a thin-bladed knife through the top opening under the back panel so that it follows the center line, as in the photo. The blade will allow the straw to cut cleanly, without damage done to the front panel below. Hold the straw straight up and down over the center mark. Press down firmly with the straw, while holding the knife steady against the pressure. Once all the way through, lift the straw out straight upward. The clay plug it cut should remain in the straw. Allow the frame to dry evenly. For a flat-bottomed frame, you may be able to stand it up on its lower edge. For a frame that won't safely stand upright, lay it flat on a wire rack like those used to cool cookies after baking. You may like the soft edges of your frame as they are, or you may want to sharpen the edges. To make crisp edges, the best tool is a SurForm (or just the blade, as I am using in the photo). After the frame is bone dry, you can use a SurForm tool to rasp the clay into flat edges and sides. Since the SurForm will create a great deal of dust, be sure to do this in a well-ventilated area (I recommend outdoors) and wear a dust mask or respirator. Smooth any tool marks with fine-grit sandpaper if desired. Your pottery heart picture frame is now ready to be bisqued. After your pottery heart picture frame has been bisqued, it is time to decorate it. You may want to use underglazes, a single glaze, or a base glaze with a design painted on with a second glaze on top of the first. For my own, I used a brush and only glazed the front, leaving the sides and back bare clay. There were a couple of reasons for this. First, I had chosen a clay body that would go well color-wise with the glaze I intended to use. I was happy for the clay to be seen. Second, I glaze fired my frame flat on its back. I didn't want any kiln accidents if the piece should fall over during expansion and contraction in the firing, nor did I want to take a chance on glaze welding it to the kiln shelf. Once the raw glaze coat has dried completely, your frame is now ready for its glaze firing. When loading the kiln, be certain to give your frame enough space and to position it so no other glazes might drip on it if they should run.